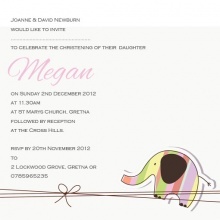 Handmade personalised christening invitations for little girls or little boys, even twins. All are printed on 150 mm x 150 mm flat high quality 280gsm card and and all come complete with either pink, blue or white envelope. Your invitations can have your guests names printed on them or be left blank for you to fill in.All are priced £1.40 each and that includes your envelope added crystals and guest printing. 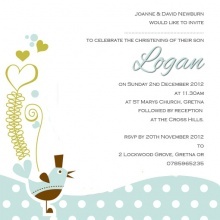 I do not require a minimum order like some companies so be it 5 or 105 I can provide you with personalised christening invitations at a reasonable cost. A Proof will be emailed you prior to printing so you can double check details but more importantly make sure you are happy with your choice.